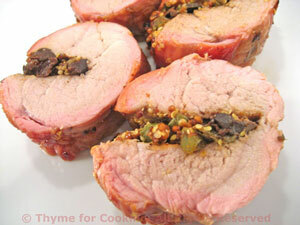 Smoked, Stuffed Pork Tenderloin, Thyme for Cooking easy summer main course. The pork is lightly smoked, using a regular grill (either charcoal or gas) rather than a proper smoker. The pink color is a result of the smoking. Put wood chips in water to soak. Charcoal grill: Put some charcoal in the barbecue, off to one side and light it. Gas grill: Only light one side of the grill. Wrap the soaked wood chips loosely in foil. Poke a few holes in the foil and place on the grill. Cook pork over indirect heat with the grill cover closed and vented or propped open an inch or so. The pork: Carefully slice the pork tenderloin in half the long way, almost all the way through. Leave about 1/3" (1cm). Open it flat, like a book. Spread the mustard on 1 side. Sprinkle the paprika, olives and capers on the mustard. Close the pork and tie securely with kitchen string. Baste once when you put it on the grill, once when you open the grill after 15 minutes to add wood chips and once when you take it off. Remove pork and let rest 5 minutes. Remove string, slice and serve. Note: You could also roast in the oven for 25 minutes, 400F (200C).